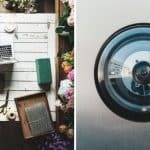 When purchasing your first workshop, or updating an old, sad-looking unit, knowing how to choose a workshop isn’t always easy. With so many designs, sizes and styles available, it’s hard to know which one to pick! 1) How will you be using the workshop? 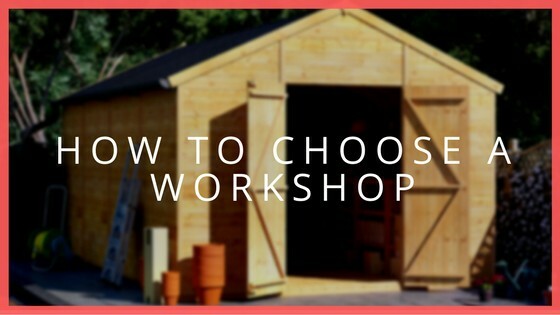 Whether you need a workshop for small DIY jobs or fancy creating a home business from your garden, how you plan on using your workshop will reflect which garden building is right for you. 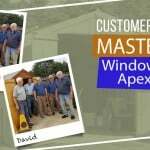 DIY Workshops – If you’re looking for a small to medium sized workshop for DIY purposes, a traditional apex workshop will do the job perfectly. 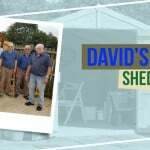 Workshops range from 6×8 and a compact building makes the perfect workshop for a small garden. Large Workshops – A large workshop is great if you need a space to manoeuvre large items or plan on adding plenty of DIY equipment into the building. Reverse Apex workshops are great for storing for long or bulky items. Double doors are important for easy accessibility. 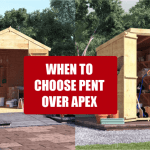 Heavy-Duty Workshops – If you intend on using your workshop all year round, you should consider a workshop which has a stronger construction such as a log cabin. 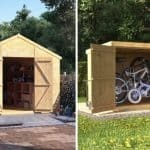 For extra storage, you can even add a lean-to on the side of the building. Traditional – Apex and reverse apex are the most traditional style workshops. These look great in any garden and will complement a traditional setting. Modern – If you prefer more contemporary units, you might want to opt for a pent workshop with modern windows, or even a corner unit. 3) Metal or wooden material? Wooden – The most traditional material used for garden buildings. If you want to add windows or shelves, it’s easy to do this with a wooden building. Metal – Although not as attractive as their wooden counterparts, metal workshops are extremely secure and weather resistant. They require little maintenance as they don’t need annual treatment. Heavy Duty Construction – If you need a wooden workshop for heavy-duty use, you’ll need a strong building with a solid construction. You should consider a log cabin or a T&G build with a large panel thickness. Anything from 19mm upwards is recommended and log cabin workshops are available in up to 44mm log thickness. Standard Workshops – The construction of a standard workshop will vary depending on your requirements. 11mm interlocking T&G buildings are great for a standard DIY workshop in your garden. Security – What kind of locking system does your workshop need? Will you need to add a padlock? If valuable items will be stored inside the workshop, security is a factor you should consider when purchasing a workshop. Windowed or Windowless – Workshops with windows offer light into the building and a comfortable environment to work in. However, for maximum security, you may prefer to have a windowless garden workshop. Doors – Will you be moving large objects in and out? Double doors make accessing the unit as easy as possible and this is featured workshops generally. Double-braced doors add strength to a workshop. Heavy-duty – 19mm T&G floors are great for heavy duty use. In terms of roofing, you should consider an 11mm T&G roof with trusses or a 19mm T&G roof. These are both suitable for the job. For ultimate roof protection, consider shingles, offering the look for a tiled roof and great cover. Standard use – Durelis solid sheet floors and roofs are well equipped for standard domestic use. It’s recommended to have roof cover on a workshop, mineral felt or sand felt will protect it from the worst of the weather. Budget options – OSB flooring is a budget option that is suitable for lightweight use only. If you will be using the workshop regularly, consider investing in a thicker roofing option such as the durelis solid sheet. Have a look at our Workshop Buyer’s Guide for more detailed information, which includes everything you need to know before purchasing a workshop. Be informed on which workshop suits you.